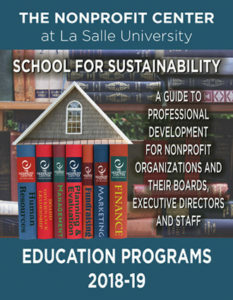 Educating nonprofit professionals via face-to-face and online classes in all aspects of nonprofit professional development, since 1981, in Philadelphia and its suburbs, Lehigh Valley and around the nation. The theme for this year’s educational activities is “School for Sustainability,” but in reality that’s been the underlying theme of The Nonprofit Center since it opened its doors in 1981. That is why we’ve educated more than 30,000 nonprofit professionals in the skills they need to sustain their organizations, ensure its viability and nourish our nonprofit community. That’s why we offer some 70 capacity-building learning opportunities every year, in addition to consulting projects, on-site trainings for groups and leadership advancement initiatives – it’s why we’re here. At The Nonprofit Center, you will always find a variety of learning opportunities in virtually every aspect of nonprofit management courses, board trainings for current and aspiring nonprofit boards of directors, nonprofit financial management, nonprofit human resources, fundraising, marketing, strategic planning and more. Our classes may be eligible for CEUs, CFREs, CPEs, CSWEs. Financial support for individual classes, excellence series, and On-site education, may be also available through TD Bank’s training resource fund.